The self-proclaimed birthplace of Icelandic rock ‘n’ roll, Keflavík has had a hard time forging a new identity for itself since the military left, beyond being that place with the international airport. However, that’s not to say there aren’t plenty of things to check out. To get the insider’s scoop on the matter, we reached out to Halli Valli, who in addition to being a massive ATP fan (and opening the inaugural Icelandic show), is the frontman of post-punk band Æla, whose roots lie in the area. 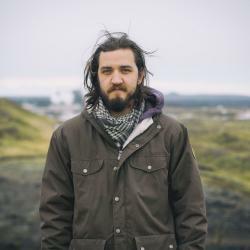 Here are his five recommendations for people staying in or wanting to pass time in Keflavík and the surrounding area. This is a super cosy restaurant by Sandgerði’s harbour. Pay attention to the ties hanging from the ceiling: they’re from the captains whose boats used to dock at the harbour before the fishing quota moved out of Sandgerði. It used to be the place I’d go to on weekends when I was coming up to my legal drinking age. The owners, Binna and Stebbi, are lot of fun; they regularly allowed me to monkey around with the sound system when nobody else was playing. This is a beautiful lighthouse that’s vital to the Reykjanes Peninsula. It’s by a beautiful beach, where you’ll find lots of birdlife. It’s a very romantic location. For outsiders, the pools of Iceland are an absolute must-see. Vatnaveröld (‘Water World’) in Reykjanesbær is maybe not the best one, except if you have kids, but it’s worth it for the hot tubs. The Sandgerði and Garður swimming pools are, however, great, with the former featuring a newly renovated swimming pool with a slide, a jacuzzi, and some great hot pots. If you’re up for a road trip, Hvalsnes is a very scenic area to drive through. Hvalsneskirkja is a beautiful church to visit, and it’s also famous for housing the tomb of Steinunn Hallgrímsdóttir, the daughter of Hallgrímur Pétursson, celebrated hymn writer of Iceland. He himself also spent his first years as a reverend in Hvalsnes, 1644-1651. The small lighthouse in Stafnes is very pretty, as is the little harbour in the armlet where fifteen sailors drowned in 1928, which in turn led to the creation of the Icelandic Association for Search and Rescue (ICE-SAR). This is perhaps something that doesn’t need any introduction for the guests of ATP. It is a must-see. This is the only bar that rocks out in the Southern Peninsula. Æla is not performing at this year’s ATP, but their second album ‘Vettlingatök’ just hit the streets.